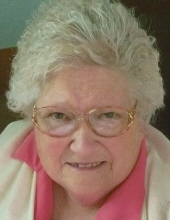 Elizabeth Zerma Iliff, 80, of Holgate, formerly of Hamler and Defiance passed away peacefully on Friday, October 26, 2018 at Vancrest of Holgate where she resided the last five and a half years. She was born October 22, 1938 in Fort Recovery, Ohio, the daughter of Walter Aurora Gagle and Jessie Marie (Harshman) Gagle. In 1956, Elizabeth graduated from Portland High School, Portland, Indiana. On May 19, 1956, she married Victor Keith Iliff who preceded her on death August 29, 1992. Besides her parents and husband, she is preceded in death by an infant daughter and children, a daughter Linda Marie Reynolds, a son John Thomas Iliff, daughter-in-law Rebecca (Bock) Iliff, grandchildren Elizabeth Yarian and Justin Douglas Iliff,. Also preceded in death by a sister Kathryn Earhart and brothers Floyd, Billie, and Merle Gagle. Elizabeth was a retiree of Campbell Soup Company where she worked twenty plus years. Elizabeth was a member of The Church of Jesus Christ of Latter-day Saints. She loved serving and giving of her time and resources. She served a Temple Mission for The Church of Jesus Christ of Latter-day Saints at the Chicago Illinois Temple and served at the Columbus Ohio Temple of The Church of Jesus Christ of Latter-day Saints. She was a member of the Malinta Post American Legion. She participated in the Campbell Soup retiree’s activities and meetings. She was involved with Boy Scouts of America and Girl Scouts, when her children were younger. Elizabeth loved sewing, cooking, canning, and reading. While at Vancrest of Holgate she was a social person, participating in the many activities there. Elizabeth showed gratitude for all she had, which was exemplified by her radiant smile. Elizabeth is survived by her sister, Wavoline Witham of Tipton, Indiana; her sons Walter Iliff of Defiance, OH and Kenneth (Theresa) Iliff, of Wayne, Michigan; a daughter Carolyn (Jim) Pratt of Wauseon, OH and daughter-in-law Gayle Iliff of Holgate, OH. Elizabeth is survived by 15 grandchildren, several great grandchildren and a great, great grandchild. Visitation for Elizabeth will take place on Thursday November 1, 2018 from 2-4 & 6-8 p.m. at Snyder-Wesche-Hoening Funeral Home, 830 N. Scott Street, Napoleon. Funeral Service will take place on Friday at 11:00 a.m. at the Church of Jesus Christ of Latter Day Saints, 858 S. Shoop Ave, Wauseon. Visitation will take place an hour before the service. Burial will follow in Forest Hill Cemetery, Napoleon. Memorial contributions are suggested to the Vancrest of Holgate Activities Fund. To send flowers or a remembrance gift to the family of Elizabeth Zerma Iliff, please visit our Tribute Store. "Email Address" would like to share the life celebration of Elizabeth Zerma Iliff. Click on the "link" to go to share a favorite memory or leave a condolence message for the family.